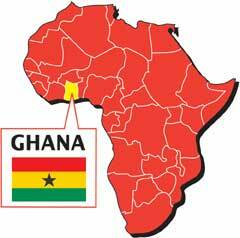 Ghana is a small country in West Africa. It is approximately the size of Oregon, turned on its side. It was the first Sub-Saharan African country to gain independence from its colonial ruler, as well as the first country in the world to have a Peace Corps program. You may be familiar with Ghana because of their awesome performance in the most recent World Cup! This trip is a volunteer vacation, which means we are going over there to work in, contribute to, explore and experience Ghana. 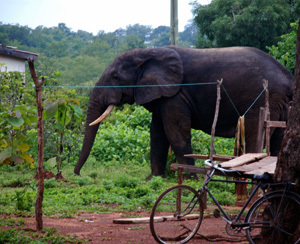 In addition to traveling around the country and seeing many of its sights, we will be staying in a rural family compound about 10 miles outside of a small city called Bolgatanga (which has all the basic amenities, including internet). Most of the people in this area are very poor. Two of our goals for this trip are to create a computer lab for student learning as well as performing other small deeds that contribute to the well being of the Talensi people of Tongo, most specifically kids. Our other goal is to expose the American students to the culture of Ghana and to teach them about life in a developing nation where things like electricity, plumbing and other amenities are a bonus, not a norm. 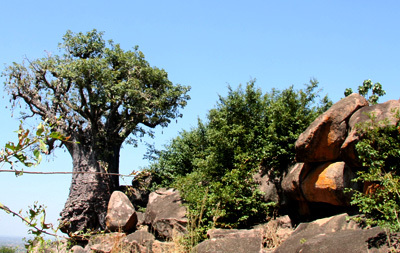 The Ghana we offer, although fascinating and exciting, is not plush and easy. We will be staying in a traditional mud and thatch family compound house (left) that was built specifically for student work-volunteer groups.The house is wired for electricity and has plumbing as well, so really, it's the best of both worlds! It's really fun to stay here. 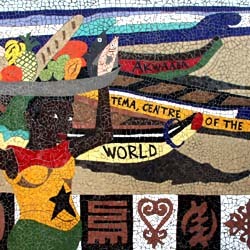 Visit to Tema mosaic, open air market and Chemu Secondary school. Volta Region, where we visit monkeys, a kente cloth weaving village, waterfalls, a bead factory, etc. Live in Kirstin & Ryan’s house, do development projects, set up the computer lab, build furniture, make a documentary. 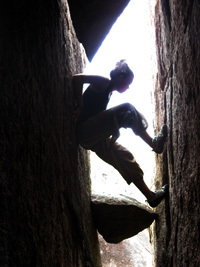 We also offer hiking and rock bouldering excursions as well as morning yoga. 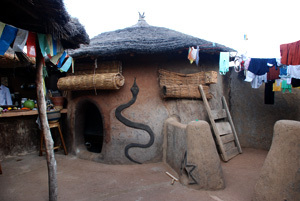 We will live in a traditional mud and thatch house that was built specifically for student groups. Family style Ghanaian meals will be prepared for us, or we can make our own. Going to the market is a part of daily African life. So is washing your own laundry by hand! Bicycles will be provided to each student for transportation, and a van for group outings. Kakum Canopy walk, and other cultural attractions.